Home » General Interest » Why Can’t We Fly? In a Nutshell : We can’t fly because we are too heavy and too weak. The simplest answer is that we are too big and heavy- bigger and heavier than any living bird, bat or insect. SO – Why does size matter? In order to fly you need to overcome the force of gravity. Flying animals generate lift (upwards force) by moving their wings through the air, but to move their wings they need another force called thrust. You need muscles to provide thrust. The bigger and heavier you are, the more thrust you need to produce, and the bigger your muscles have to be. This is where the problems start. Although bigger muscles do produce more power, the relationship between muscle size and power is not straightforward. A muscle that is twice as big does not produce twice as much power. This is because muscle strength depends on the cross-section of the muscle not its overall size, so that while the mass of the muscle increases to the power of 3, strength only increases to the power of 2. So to get a muscle that is four times stronger you need one that is 8 times bigger. This is why flight is possible for relatively small animals, but gets increasingly hard as body size increases. Large birds like the albatross and the condor are not strong enough to do much flapping and mostly rely on gliding flight. So by the time you get to a bird as big as a man you would need wings at least 7m across, but such big wings themselves would weigh a lot. To flap a pair of 3.5m wings hard enough to lift around 100 kg (220.46 lb) of weight (roughly what a man would weigh if he had 7 meters of wing) would need muscles many times stronger than the human arm and chest muscles. What’s more, because strength does not increase as fast as mass, the muscles in question would be unfeasibly huge, adding yet more weight to the imaginary birdman. They keep body weight down with hollow bones. They maintain a very high metabolism with better lungs than mammals. They use feathers to keep in body heat. They have very large chest muscles, and very large keel bones for the muscles to fix onto. This wide range of adaptations probably explains how some prehistoric birds, and possibly some prehistoric reptiles, managed to be as big or even bigger than humans. Quetz alcoatlus, a pterosaur from the Cretaceous era (about 67 million years ago), had a wingspan of around 12m and may have weighed up to 100 kg (220 lb). It was the largest flying animal of all time, but possibly not the heaviest. That accolade belongs to the giant teratorn, Argentavis, a vulture-like bird from the Miocene era (6-8 million years ago), with a wingspan of 7.5m and a weight of around 120 kg (265 lb). These monsters could probably barely fly, and must have relied almost exclusively on gliding. 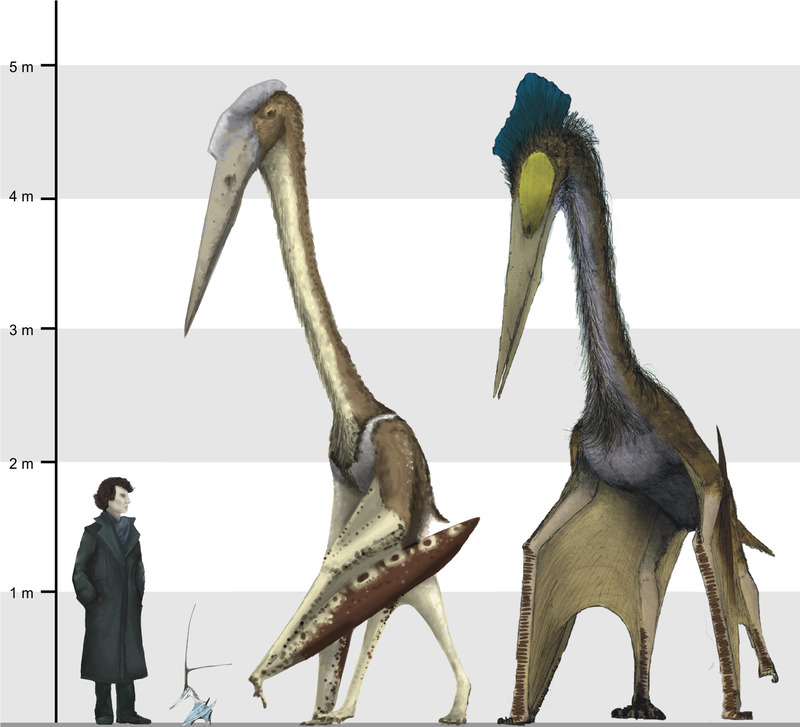 The fact that, in terms of weight and wingspan, they match up with our imaginary birdman suggests that maybe he would just about get airborne. Once he had managed this, gliding would be relatively easy. In fact humans with wingsuits can already manage glides of over 16 km (10 miles).